This week we chatted with Natasha Harden, the founder and owner of Halmoni Vintage in East Oakland. In the latest installment of our interview series, Natasha discusses her inspiration for opening up shop, her store’s focus on women of color and all body types, and her personal style. Twenty Two: Let’s start with the basics. Can you tell us a bit about yourself? Natasha: I am originally from NY, born and raised in the Boogie Down Bronx. 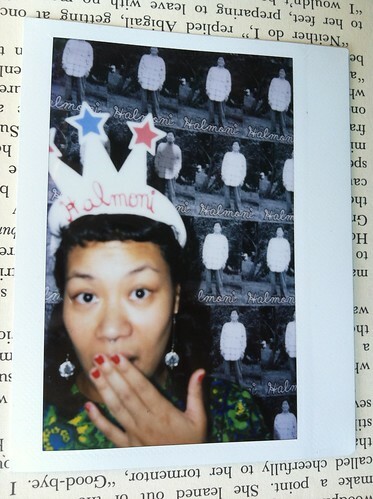 I am the owner of Halmoni, a vintage boutique in Oakland, CA, which means I breathe, sleep and eat vintage. I am also a double Virgo with a Cancer moon, born in the year of the rooster. Twenty Two: Have you always been interested in fashion and specifically vintage clothing? Natasha: When I was younger I actually hated fashion and shopping. I thought fashion was pretentious because I couldn’t afford to keep up with the constantly changing trends and name brands that didn’t suit me or my body type. Finding plus-size, fashion forward clothing was a chore and it wasn’t until I was introduced to thrifting and vintage which helped to change my perspective on fashion. Shopping at thrift stores and vintage boutiques that carried clothes that fit my body type helped me to be more of an individual in the sea of NYC. Twenty Two: What inspired you to open Halmoni Vintage? Natasha: I could be considered a borderline hoarder. I love collecting things. I have stuff everywhere in my apartment so when I was unemployed last year and was trying to figure out which direction to turn, I created my own career that fuels my addiction to stuff. I’m a thrifting maniac and have always been into buying things that were just cool. I like to think of myself as the search and rescue team for all things vintage. Twenty Two: How do you differentiate your store from others? Natasha: My point of view on vintage is very different because of who I am and where I come from. Women of color are not really represented in the vintage industry and I want to change that. I am also very community-oriented so my shop is more than a vintage boutique — I see it as a cultural center for the neighborhood. Twenty Two: What features do you look for in a garment when you’re adding new merchandise? Natasha: I have this spidey sense about vintage. I can just feel the past energy of an item vibrating and I am drawn to it. When I am out on the hunt for merchandise, patterns, colors and textures always play a role in what I pick to curate the shop. Twenty Two: Can you tell us about some of the events you host, like A Naked Lady Soiree, Women of Color Entrepreneurs Meet and Mingle, and the First Friday Art Party? Natasha: The Art Parties have been a huge success. We host local artists every month and it brings out the neighborhood, which has been so supportive. A Naked Lady Soiree is a clothing swap here at the shop for women of all body types to create community, form support networks and, of course, get new clothes. Clothes that are left over from the swap are then donated to a homeless shelter for youth here in Oakland. The next Naked Lady Soiree is on September 23rd from 6-8pm at the shop! I am currently planning another Women of Color Entrepreneur Meet and Mingle for the fall. I started this event so that I could create a support network for women of color who are business owners and entrepreneurs. I have just completed my first year in business and there are so many questions one has when they open a business and this was my way of creating a space to talk about things like that. Twenty Two: How would you describe your own personal style? Natasha: I am like a fashionable grandma and librarian had a baby together who was born and raised in one of the fashion meccas of the world, NYC. Twenty Two: What are some of your favorite clothing stores in the Bay Area? Natasha: The only thing I buy new are my underwear and Vans so it is hard for me to answer that question. I heart Thrift Town (the East Coast doesn’t have Thrift Towns) because they always have a tag that is 50% off and they have punch cards so you can eventually get $10 off your next purchase. Twenty Two: How has growing up in New York and living in Oakland influenced your work? Natasha: Growing up in New York has definitely influenced who I am and what I do. Because New York has so many people, in many ways it can be difficult to stand out as an individual. So it brews this “in your face” type of fashion sense and I definitely have that. Oakland helps to nurture my inner Cali girl because I love how laid-back and stylish it is. Oakland has also helped to sprout all the seeds I have sowed in my life. Twenty Two: When you’re not working, how do you spend your time? Natasha: I am an aqua aerobics fiend. I love it so hard because sweating is not an issue when you are in water and it is part of my self-care. (I am not an exercise type of person.) I also like to veg out watching Law & Order. Twenty Two: What can we expect to see from you in the future? Natasha: I want to be on TV, so stay tuned! Twenty Two: What advice do you have for aspiring entrepreneurs? Natasha: Don’t let anything stop you because everything in life is a negotiation. Forget about credit, loans or whatever else is a hurdle. Take action! A special thanks to Natasha for giving us the opportunity to learn more about her shop. You can keep up with Halmoni Vintage by checking out their website, Twitter, and blog.